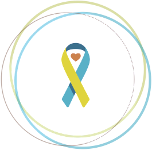 On Saturday, March 24th, the Fun Coast Down Syndrome Association will celebrate its 13th Annual Buddy Walk® at Central Park in Palm Coast, FL. Leading the group of teams helping the FCDSA work toward their $40,000 fundraising goal is Carl’s Crew, led by team captains Angela Bowdre and Samantha Snowden. We had the pleasure of learning more about Carl and Fun Coast’s event from Angela and Samantha as they prepare for their celebration in March. Carl is an adorable one year old who loves to play with blocks and any of his toys that light up and make noise. He is close to sitting up on his own! His mom, Angela, used to work with Samantha, who is the Vice President of the Fun Coast Down Syndrome Association. Carl was born very early (at 25 weeks), and when he was about 10 weeks old, Angela reached out to Samantha for support because she remembered that Samantha is connected to the FCDSA. “Once Carl is stable and we bring him home, we need to talk,” Angela told Samantha. When they finally connected again, Samantha provided Angela with the contact information for Paula Wilburn, Executive Director of the FCDSA. Samantha shared that Paula is such a great advocate for the Fun Coast families, and she wanted Angela to have access to that support in their community. She also asked Angela to co-captain a Buddy Walk® team with her. “Carl is already so loved in the community,” she explained. Samantha is not directly related to anyone with Down syndrome, but four years ago, she met Paula when her son broke his arm and Paula was the nurse at the orthopedic doctor’s office. Paula invited Samantha to the Buddy Walk®, and she attended as a spectator. Samantha met Paula’s son, Keaton, who has Down syndrome, at that Buddy Walk®, and she was hooked. “I was theirs forever,” she said. “Paula got me through Keaton.” Since then, Samantha has teamed up with a family who has a loved one with Down syndrome to assist them in fundraising for the Buddy Walk®. This year, she is happy to work with Carl’s Crew, and they are currently a top fundraising team as well as the largest team! Each of the Carl’s Crew team captains uses Facebook to spread the word about their fundraising and to recruit team members. Samantha explained that she posts often, because “People get busy and need reminders.” She advises team captains to “pick a day every week to post about your team, and keep doing it!” Angela agrees, saying that she uses Facebook networking as her biggest fundraising tactic. Samantha also hosts a paint night fundraiser, and the owner of the paint studio gives 65% of the proceeds back to FCDSA. Last year, Samantha’s team raised $495; it’s their biggest fundraiser every year. Samantha describes the FCDSA Buddy Walk® as a “full day of fun.” She explained that all the self-advocates are involved, and once you come to the event, you get to know all of the self-advocates. The Carl’s Crew team members will experience all of this, and get team t-shirts courtesy of a local company which has offered to donate the shirts for the entire team. “There is no better feeling than giving back, especially when it comes to Down syndrome. There is nothing better than spending the day with self-advocates. If you want to give back and feel good, join a local Buddy Walk® event,” Samantha said. 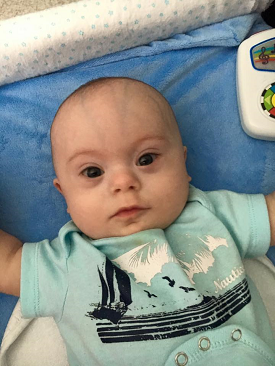 In addition to feeling good about giving back to the community, Samantha hopes that their team members will leave the Buddy Walk® feeling like they’ve received an education about Down syndrome, and feel more comfortable around people with Down syndrome. “People don’t understand,” she shared. 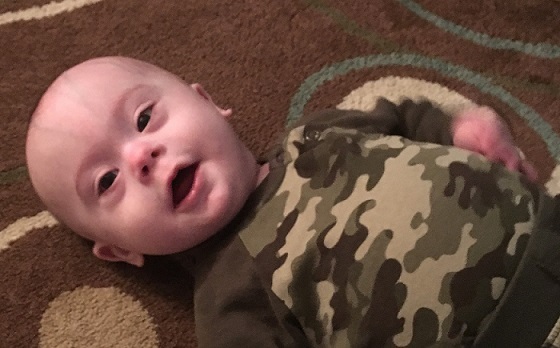 “Down syndrome is now on the forefront, because of the new Gerber Baby.” Samantha is hoping that because a lot of people now have a connection to the Down syndrome community through Angela and Carl, they will understand and be more accepting. 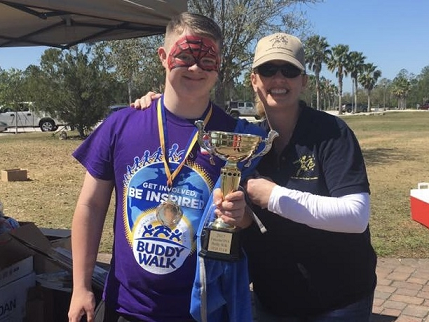 For more information about the 13th Annual Fun Coast Buddy Walk®, to register for the walk, or to make a donation, please visit their Stride fundraising page here.